Enforced disarmament has often been ignored by historians, diplomats, and strategic analaysts. Yet the democracies have imposed some measure of disarmament on their enemies after every major victory since 1815. In many cases, forced disarmament was one of the most important, if not the most important, of their war aims. The demilitarization of Germany and Japan, for example, was one of the most significant post-war measures agreed by the Soviet Union, Britain, and the USA in 1945, whilst the debate on the disarmament measures imposed on Iraq after the Gulf War continues to rage. The efficacy and durability of enforced disarmament measures, and the resistance they are likely to encounter are thus issues of central strategic and political importance. 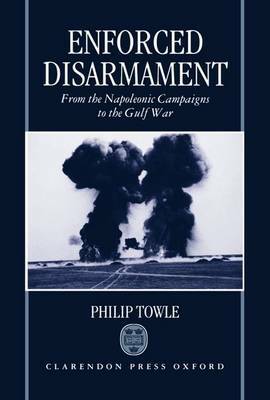 Philip Towle examines the most important peace settlements from the time of Napoleon to Saddam Hussein, in the first major history of this fascinating subject.